New York, March 14 (IANS) Meeting US leaders in the wake of the Pulwama suicide attack and the regional tensions arising from it, India’s Foreign Secretary Vijay Gokhale has evoked Washington’s firm resolve to stand "shoulder-to-shoulder" with New Delhi in fighting terrorism. As they sought to advance India-US strategic partnership, terrorism was a focus of the talks he had with Secretary of State Michael Pompeo, National Security Adviser John Bolton and other administration officials and Congressional leaders during his three-day visit to Washington that ended on Wednesday. Bolton tweeted after their Wednesday meeting: "The US stands shoulder-to-shoulder with India in the fight against terrorism." Giving the same message, Pompeo spoke of "the importance of bringing those responsible for the attack to justice and the urgency of Pakistan taking meaningful action against terrorist groups operating on its soil," a State Department spokesperson said. The strategic partnership is being built around the "shared vision" for the Indo-Pacific region, as Bolton put it. President Donald Trump wants India to play a major role in the region where he sees the two countries as bulwarks of democracy against China’s dominance. Prime Minister Narendra Modi has cautiously embraced the role without making it appear a direct challenge to China. India and the US have also stepped up multilateral cooperation with the other two major democracies in the region, Australia and Japan. The US and India affirmed "the importance of joint leadership to strengthen the rules-based order" in the region and acting "in conjunction with other Indo-Pacific partners", said a joint statement issued after the Foreign Office consultations he held with David Hale, the Under Secretary of State for Political Affairs. After meeting Gokhale, Brad Sherman, the chairman of the House of Representatives Subcommittee on Asia, the Pacific and Non-Proliferation said that they discussed US’ role in India-Pakistan relations. During the India-Pakistan crisis that followed the February 14 Pulwama attack by the Pakistan-based Jaish-e-Mohammad (JeM) terror group, Pompeo, who was in Hanoi for the US-North Korea summit, worked the phones with External Affairs Minister Sushma Swaraj and National Security Adviser Ajit Doval and Pakistan’s Foreign Minister Shah Mehmood Qureshi in an effort to tamp down the rising hostility. He pressured Islamabad to release Indian pilot Abhinandan Varthaman, who was captured by Pakistan after his MiG-21 was shot down in an air skirmish to cool the tenions. Sensing that Pakistan’s role in supporting terrorism would figure in Gokhale’s meetings, Qureshi called on Bolton on Monday and assured him that "Pakistan would deal firmly with all terrorists and will continue steps to de-escalate tensions with India". Pompeo also sent a clear signal to China against blocking UN sanctions against JeM chief Masood Azhar. He said that such an action would go against the Washington-Bejing mutual interest of ensuring regional stability. Two areas of discordance between India and the US also emerged during the meetings. Preoccupied with trade imbalances, Trump recently ended some trade preferences for India under the General System of Preferences and lashed out at tariffs and restrictions on American imports to New Delhi. Pompeo, according to his spokesperson, called for "joint efforts to expand bilateral trade in a balanced and reciprocal manner". In response, Gokhale "underscored the significant reduction in trade deficit in the last three years and conveyed India’s willingness to remain engaged with the US for a meaningful and mutually acceptable package on trade issues", the Indian embassy said. Another was Pompeo’s request to Gokhale for joining the boycott of Venezuelan oil to pressure President Nicolas Maduro to step down in favour of opposition leader Juan Guaido backed by Washington. India is a major buyer of oil from the South American nation and shows no signs of ending the purchases. Nuclear energy cooperation was an area of trade and economy in which there was progress. 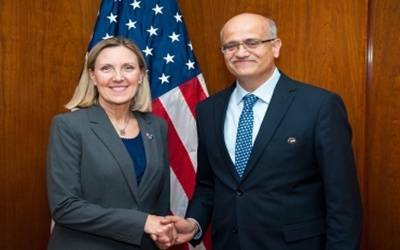 A joint statement issued after the Ninth India-US Strategic Security Dialogue led by Gokhale and Andrea Thompson, the Under Secretary of State for Arms Control and International Security, breathed new life into plans for set up six nuclear power plants in India. "They committed to strengthen bilateral security and civil nuclear cooperation, including the establishment of six US nuclear power plants in India," it said. Even though the India-US civil nuclear cooperation agreement is more than 10 years old, the power plants it envisaged have yet to take shape as they first had legal hurdles and then the American company ran into financial difficulties that may now have been resolved.